The upcoming mobile learning conference organised by the eLearning Guild: mLearnCon (10 - 13 June 2015 in Austin, Texas) will bring mobile learning enthusiasts together and offer great networking opportunities. If you have a speaking proposal in mind, you can submit it here. In running up to the conference, I remembered that I did not share a mobile design paper from 2013, which was published in the Mobile Handbook, an award winning book edited by Zane Berge and Lyn Muilenburg. Because the design emerged from two early online courses on mobile learning (MobiMOOC), I thought it would be good to share the paper, as it links to both practical and theoretical mobile learning tools and dynamics. Since publishing the paper I have been using the mMOOC design to see what works, and what has changed, and I will get that down in a short article later. 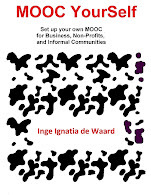 The paper entitled 'mMOOC Design: Ubiquitous, Open Learning in the Cloud' can be read in draft version in Academia. Abstract of the paper: In the mMOOC design chapter an overview is given of what a MOOC is and how it can be optimized for mobile device delivery and interaction. The chapter starts with an overview of contemporary, educational challenges in this Knowledge Age, after which the mMOOC design is described. 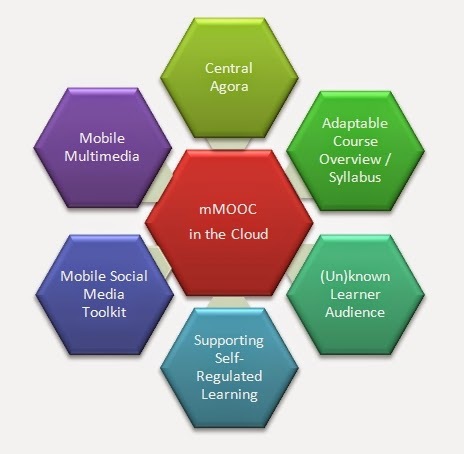 The mMOOC design combines characteristics and strengths of both m-learning and the Massive Open Online Course (MOOC) format. By using emerging technologies (selecting mobile social media, enabled mobile multimedia) and stimulating content dialogue and self-regulated learning, the course design allows learning to take place in the cloud and being directed by the learners. How do we see the world when Artificial Intelligence takes over work that we find 'humanly satisfying'? What about game-based learning? Is it really such a game-changer, and if it is, than what do we think about computers teaching themselves to be better (than us humans in these games)? Education might get under pressure, as automation and learning creeps in from the digital world. Will Art be the last job standing? All of these ideas are fine with me, as long as we readjust society to cope with these new, upcoming - and more than often based on learning - realities. Can we rethink our place as humans in this increased technological world, and in such a way that we will all still be able to have a sense of intellectual satisfaction? Or will we get globally depressed once we acknowledge that our brain can be outrun by any improved AI DeepMind next generation computer or algorithm? Google's DeepMind is something to be reckoned with, and an technological evolution that will push us to rethink society (at least, that's what I think). The DeepMind algorithms are very interesting, as they can be seen as self-adjusted learning/teaching algorithms. DeepMind is used in DeepFace in the form of DeepLearning (earlier blogpost on it here), and now DeepMind cracked the teaching/learning code to get better at simple video games (yes, this does relate to the tech teenage movie WarGames, the movie from 1983) as The New Scientist (and others) reported today. This is a great breakthrough in technology, but potentially one that can influence learning/teaching and society. First of all, I am all for it. Evolution is needed, especially when looking at the boundaries of humanity (evidence-based research seldom results in other more durable approaches (think climate, hunger relief...), war is still a major driving force although we all know the downsides of it). So in a way, my hope rests in the next phase of existence, which might just be fully digital, with us humans as reservation or zoo kept animals, that are provided toys just like our closest biological sisters and brothers, the apes. But there is a downside as we are in a transition zone, where AI is not yet capable of taking over, and humans are decreasingly needed. The shift from the biological to the computational needs to be made more pleasant. Allowing people all over the world to be have their little piece of Eden, before the fully computational revolution takes over. Education can help, especially lifelong learning, as this will allow us to re-evaluate which opportunities are still open to us humans, and how (or where) we need to turn to reshape our knowledge, or take on a new identity that will allow us to live a satisfactory life in this transition phase between the human-biological and the computational-digital life. Education would as such no longer need to be job-focused, but more life-focused: sustaining and supporting that which makes us humans feel satisfied, intellectually balanced, good. Elearning or online learning with multiple devices, across location and time is a good option to re-adjust life to fit these new, upcoming artificial intelligence changes. At best, online content is shaped by cooperatively working on a particular subject. Multimedia files, content, contextualized authentic learning experiences... all of these can be brought together much quicker then ever before, and built by all of us putting our heads together (standing on the shoulders of giants comes to mind). 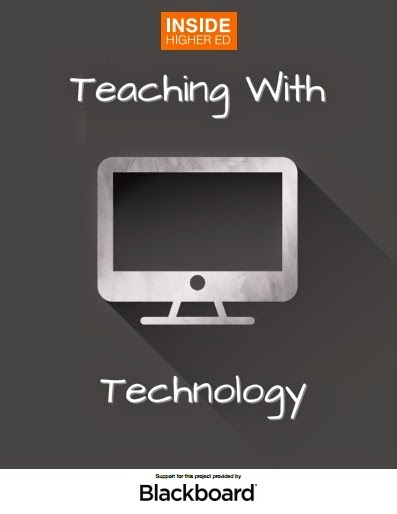 So, in a way, online learning can offer quick responses to new societal changes. Providing new opportunities, new ways of looking at the rapid changes, and at our human identities against the backdrop of a changed, more AI oriented society. The 46 page research report on 'Mobile pedagogy for English language teaching and learning: a guide for teachers' is a practical and informative report. The report was written by experts (Agnes Kukulska-Hulme, Lucy Norris and Jim Donohue) in the field that combine a strong theoretical background with experienced practical projects, this combination clearly adds to the relevance of the report. The report addresses the challenges of English teachers, a framework is offered which points towards all the dynamics and interactions that are part of the overall language interactions between teachers and learners, once the framework is described a practical example of the application of the framework in a real lesson. 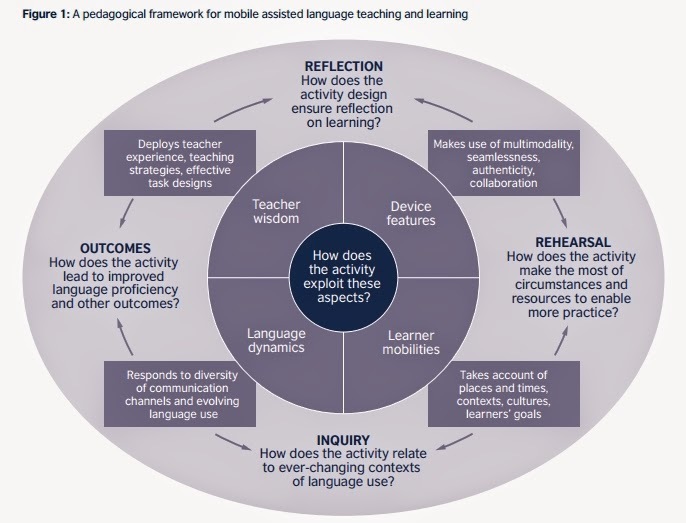 Because the report offers a range of practical activities with clear links to learning goals that are addressed by these activities as well as suggestions for implementation, the report enables a clear and immediate understanding of the mobile opportunities that are suggested (e.g. 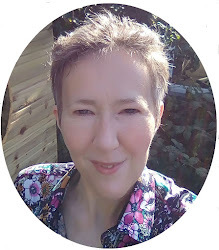 actions: feeding back after task or class (Learning-Oriented Assessment), or another activity: the ‘ideal self’ language user; reflecting on learning and motivation - which encourages learners to be more active and reflect on real language performance). A great and practical read. Since the announcement of DeepFace and its consecutive reasonance in the media, the facial recognition algorithm from Facebook, it aroused both interest and critique. There are many arguments to consider privacy issues before sending out these types of identity related software's out there ... into the public world. But no matter what the status of the philosophical decisions is, DeepFace is now ready to be fully deployed after a successful pilot. Every type of technology is embedded in a context and ecology, which makes it an integral part of a holistic society. And as a human instrument, it inevitably leads to many discussions whenever it changes contemporary habits. Nevertheless, each technology also adds to a bit of fun. And I see it as an informal duty of each learning technologist, tech geek... or all-round nerd-joker, to investigate the fun-factor of these types of algorithms. And that was what I was thinking about during last night. Deep Face recognises more people than I ever would (I have trouble recognizing faces, and not coming anywhere close to the 97,5 % average of most people), and has almost reached human recognition stats (97,25 %). 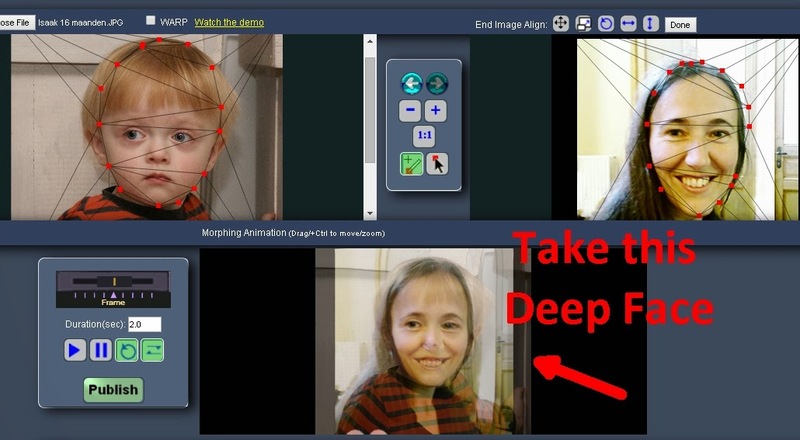 The rotation challenge: DeepFace uses a 3D model for rotating faces virtually so that the person in the photo appears to be looking at the camera. The algorithm draws its power from Deep Learning, a visual as well as audio (language) recognition system set-up by Google. Where deep learning has reignited some of the grand challenges in artificial intelligence, due to its use of computational power, use of big data, and adaptation capacity. Exploring the boundaries of morphed images and DeepFace. Another fun activity, that will allow you to see how much tweaking you can do to your own face, before DeepFace stops recognising you. As a test I already morphed me with my son. Quick online morphing option: 3Dthis.com . As you can see: fun guaranteed. I feel that I should add this concept of the Fun-test to my repertoir on getting and screening new technologies. With Microsoft providing a glimpse into its hololens project (related to Windows 10 options), I felt it would be good to recap on augmented reality, and see what thoughts come to mind when thinking about the exiting hololens endeavor. The concept of augmented reality has been around for quite some time. More then hundred years ago (1901) Frank Baum - author most famous for the Wizard of Oz - came up with the idea of an electronic display that put a layer over the real life world. As graphics and computational power increased, Steve Mann (who came up with the wonderful concept of Sousveillance, appreciated by activists everywhere) came up with a system that put text and graphics over a photographic image, creating an augmented reality, the eye-tap. This is where it becomes of interest for education, as simulations become a possibility. By 2008 augmented reality is being rolled out for the masses: wikitude, Layar, and the inevitable introduction of augmented use in marketing (printing, buying via qr-codes...e.g. metaio) becomes possible through the use of mobile phones with apps. As augmented reality becomes more mainstream, the public implementations, and job performance options become more apparent, which leads to bigger projects. In education augmented reality has been used in video support of specific historical reenactments (now frequently used in documentaries, for example in the 3-D imaging put on top of the real world in this trailer of Archaeology of Portus). The implementation of augmented reality in professions indirectly or directly related to design, architecture, engineering are straightforward: augmented reality allows a concept or new design to be investigated with less cost, and 3D models. Augmented reality has been successfully implemented in guiding workers to do specific (new) jobs by providing them on-site virtual support on what they needed to do with the parts they needed to fit together (e.g. nice slide-deck on topic). The roll out of mobile technology and mobile devices was crucial for sending augmented reality out into the real, mainstream world. And those same mobile devices had something that would increase augmented options: the mobile device sensors. With these sensors multiple tracking and spatial location options became possible, increasing the overall augmented reality experience. The mobility of all of us, pushed augmented reality into the public sphere. There were some first steps into a more holistic, augmented approach for the general public: Google glass, metaglasses... but now Microsoft comes up with the stand-alone (nice!) hololens computer. The hololens offers to be a fully functional computer option that allows you to interact in a space - living room or office or park, anywhere... without markers, wires, nothing, just the device as a native instrument. And, what is a great addition: it builds upon the motion detection that was put on the map by Kinect. As such it combines human motion, with mobile sensors, to dip into all the digital content that is already out there on the Web, in the Cloud... so no more wires, just tapping into the virtual, digital world. It seems like a real augmentation of the human body and mind. I like it, a lot. Especially because it is a native machine. And of course it offers options that no other device ever offered, as such it brings along the pleasures of tinkering with a new invention. The options for education are multiple: augment the classroom, augment housework, increase informal, augmented and immediate learning... It is a really cool tool, a nice new human instrument. But what are the first ideas that come to mind when reflecting on possible side effects? 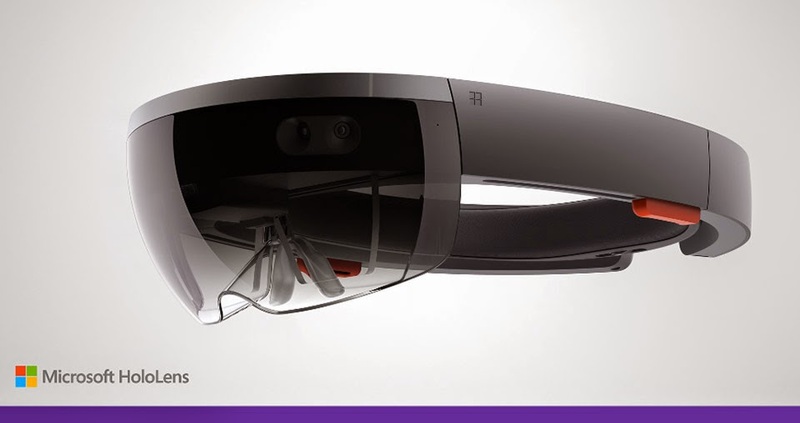 The promo-video talks about 'More reality than ever before' is one of the motto's of the hololens. And I can see how this seems like a truth, but is it? Because with our brains, there are only so many inputs that can be processed. So, we might be able to gain time when using the hololens (no longer having to find wifi first, or other barriers that limit immediate access to content), and time might be used in an optimal form due to the merging of data (e.g. recognize face - know what they do or expert at - so immediately strike up a conversation - or not), but reality is the sum of all things, and our concentration picks up whatever we are searching for. More virtual options for thinking over design (any field) also means that less people are necessary in those fields. What can be done digitally, must not be done manually. This will affect the job market - for those designer support jobs at least. The immediacy of the information and augmentation also makes me wonder about the immediacy of propaganda. Photoshopping will be immediate, merging live events with fake objects/people and streaming them as if it is real. And inevitably the barrier of us humans becomes clear once again. We invent things, apply them, but we never seem to cross over to the other species, the super-human, or the non-human. Anything and everything we do seems to mimic humanness... I wish we could get over that. 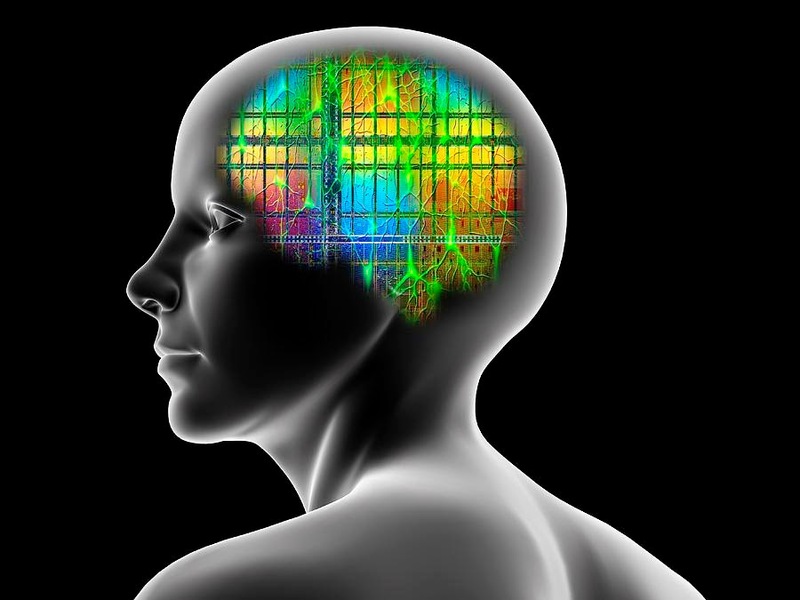 The Specific Absorbation Rate (SAR) information would be of interest to me, as it is a stand-alone device which is worn close to the brain. 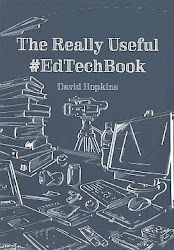 The 35 page report (or booklet) on Teaching with Technology was just released by the Inside Higher Ed magazine and written with support from Blackboard (the LMS). This means that a certain LMS-focus can be felt, nevertheless, the report does highlight some ideas and EdTech initiatives in a transparent way. The report is free, and can be downloaded (after providing name, email, and job title to Inside Higher Ed) at this virtual location. And you may sign up here for a free webinar on Feb. 17 at 2 p.m. Eastern about the themes of the booklet. The booklet starts off with some figures regarding educational change: 98% of college & university presidents think that change is needed in education a and 67% think the change needs to be disruptive (Chronicle of Higher Ed study from 2014). The definition of student success is broadening with a necessary focus on learner-­‐desired outcomes beyond our traditional institutional success measures of progress and completion. modularization: this Higher Ed option is increasingly being rolled out as an option for students to either build their own curriculum (or part of it). Now major universities are also interchanging topics, e.g. Yale will be streaming Harvard's course on computer science CS50 to its students in the fall 2015. (personal note: interesting adaptation of the Payed Educational Resources option, and it offers a view into Future modularization where different universities develop different modules that can be part of a full curriculum. This might also result in universities that focus on specific fields, rather than full options. A bit like the changes happening in certain countries with k12 options: a language school, a STEM-school, a business school...). License to teach online: another oldie that is now getting formalized: demanding faculty to take a 'Digital Driver's License' course in order to be eligible to teach online. As an incentive a small stipend is given to the teachers who are willing to take the course (case of Saint Mary's college of California). Blended approach for liberal arts: nice option to embrace both face-to-face and online learning opportunities that allow faculty as well as students to keep the benefits of both and engage in meaningful actions in both worlds. Connecting to international classrooms: also an old option (learning experiences in other countries), which is now gaining interest due to technological solutions. By connecting classes with students from different countries (but who are able to all talk the same language in order to communicate), all students learn from the experiment (e.g. connecting college classrooms from Morocco, Pakistan, US). This type of learning has multiple names: COIL, online intercultural exchange, virtual exchange, globally networked learning, telecollaboration... but the course aim is always the same: to facilitate class discussions and do collaborative course assignments across national borders and time zones. The course exchanges can be synchronous or asynchronous, or involve a combination of both. A MOOC-like master degree: the full option of online learning, which in all honesty has been tested and done by all Open Universities everywhere. This change from residential to online learning does have an effect on teacher and teaching assistants profiles and numbers. And of course a brief focus on the flipped classroom, as well as a focus on the success of Purdue's Signals - stoplights for student success. Brief report, with known topics that are explained in a short and sweat way, and in between a bit of Blackboard advertisements with links to other reports.